Bekaert’s Cattleman 14g Barbed Wire is the strongest, longest lasting barbed wire fence on the market and is perfect for the most demanding fence jobs. The reverse twist design and Class 3 galvanized coating has proved Cattleman 14g Barbed Wire to be 30% stronger than 12.5g low carbon and Gaucho 15.5g High Tensile Barbed Wire. With Cattleman 14g Barbed Wire, you can expect easier installation, increased post spacing and less maintenance over time, providing you with the best value. 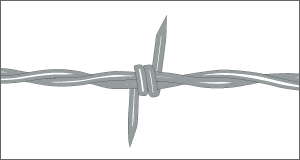 In addition to Class 3 galvanized coating, Cattleman 14g Barbed Wire is also offered in Zinc Aluminum and painted finishes.